This is a sponsored post, but you know me well enough by now to know that I wouldn't be wearing these gorgeous shoes from Moshulu if I didn't truly love them. And it's not just about the shoes..... there's a heap of top tips on how to style up old and new summer clothes to get the most out of your wardrobe by mixing and matching. Hope you like. My gorgeous jackadoodle Jack, approving of my new dress and shoes! You know that I love fashion, love vintage & re-cycling, and love dancing & walking....but I also want to be comfortable, as well as looking fab, when it comes to shoes and sandals. (I can't do that tottering around in heels thing for more than an hour nowadays!) So when shoe company Moshulu, offered me some of their new Glitter range to dress up my latest summer outfits, I just jumped at the chance. Especially as they're based in Devon and I like to support UK brands, as I am sure you do. The headscarf is a cheapie and an oldie; the vintage look red sunnies were found at Vintage Brighton, for a fiver; the straw, retro looking bag, is from M & S, and the Moshulu Cherry Red Margarita glitter sandals just make me want to dance through my day! Again, I am wearing an ancient headscarf; my original 50s sunglasses; a very old shirt from H & M; a new arty necklace found at the Museum of Modern Art, San Francisco, (love a Museum Shop!) and a new pair of capri pants, 50s style, from Hell Bunny, just £24.99. The Cherry Red Margarita sandals just finish my outfit off, as well as keeping my feet happy with their springy cork soles! This Adidas jacket is just the ticket for our ever-changing UK summer weather and only cost $20 from Buffalo Exchange in Portland. (You must visit if you go to this great little city, my fave & cheapest buys were all found there and there's no sales tax in Portland!) Buffalo Exchange is also all over the U.S, if you fancy a bit of thrift shopping. The vintage kimono was imported from Japan, so not my normal bargain costing about £60, but just look at that fabric and pattern. What a find! The linen pants were bought in Melbourne an age ago, from Havana Blue in Melbourne, the necklace is made from vintage pieces by Ghost & Lola in Byron Bay and the headscarf is a vintage piece of material! I think the sandals work really well considering I am mixing authentic vintage with modern, don't you? 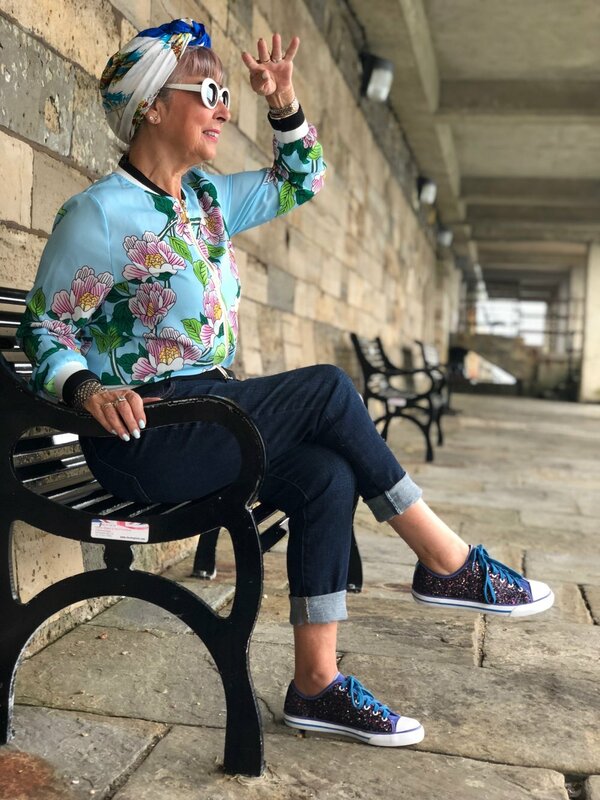 My 80s looking sweater was found in River Island years ago and is so cosy teamed up with my 50s style jeans, a vintage headscarf & sunnies, while the glittery footwear adds even more of a retro vibe! 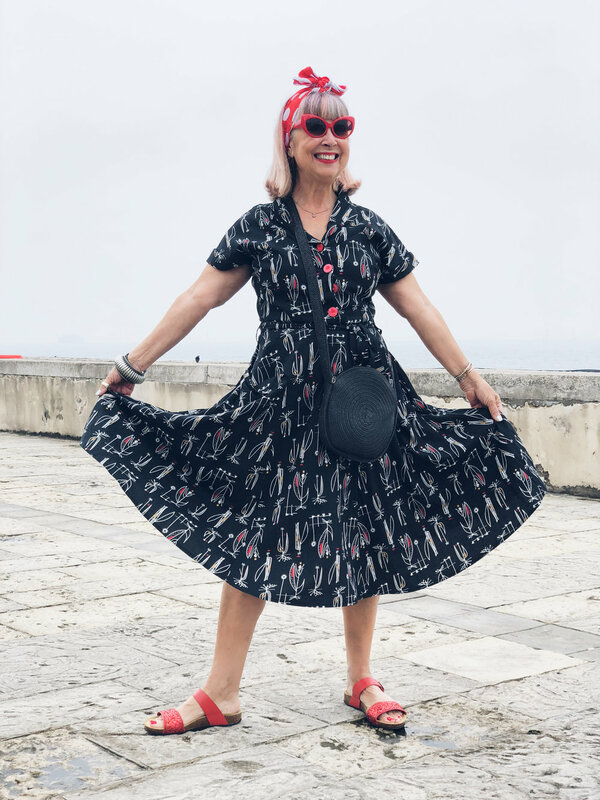 This time, I managed to tie my headscarf in true 40s style and with some cheap retro sunnies, from L.A, am just loving this look - in Portsmouth! I am also thrilled that the blue in the shoes actually goes with one of my retro summer frocks proving that sneakers don't need to be kept just for jeans. Big thanks to Mo for lending me Pepper, the adorable four-legged model! The dress is an oldie by Lazy Bones, in Australia, and the sunnies were, again, a fiver from Vintage Brighton an age ago! So there's a little look into some of my old and some of my new, favourite outfits for the summer. I am thrilled with the shoes and sandals as I have broad feet and high arches so really appreciate Moshulu's design and great on-line service. They do free returns and free p&p on replacement orders, so you can try various sizes and widths in the privacy of your own home. Apart from being both foot friendly and pretty, the prices aren't bad either! The new Glitter Collection ranges from £49 to £55. I think that's very reasonable for comfy sandals that add sparkle to any outfit, and I can still walk towards my 10k steps a day in them! 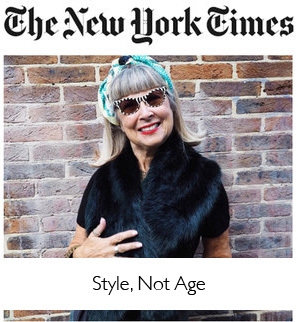 Jun 4 The Rolling Stones: an alternative ageing message for us all!